The Eagle Ford Shale is a Cretaceous sediment that was traditionally known as a source rock in South and East Texas. The formation is the source rock for the Austin Chalk oil and gas formation. Producers also drilled through the play for many years targeting the Edwards Limestone formation along the Edwards Reef Trend. It was not until the discovery of several other shale plays that operators began testing the true potential of the Eagle Ford Shale. The shale is more of a carbonate than a shale, but "shale" is the hot term of the day. The formation's carbonate content can be as high as 70%. The play is more shallow and the shale content increases in the northwest portions of the play. The high carbonate content and subsequently lower clay content make the Eagle Ford more brittle and easier to stimulate through hydraulic fracturing or fracking. In geological terms, the Eagle Ford dips toward the Gulf of Mexico. The formation was first targeted by Lewis Energy in 2002, but most give Petrohawk Energy (acquired by BHP) credit for discovering the Eagle Ford play many are targeting today. Legacy Austin Chalk producing areas (e.g. Giddings Field) have not proven to be the best drilling targets for the Eagle Ford. One theory is the Eagle Ford Shale formation improves as you move south due to degradation of the Austin Chalk's reservoir properties, which in turn means the play expelled less oil and retained more. 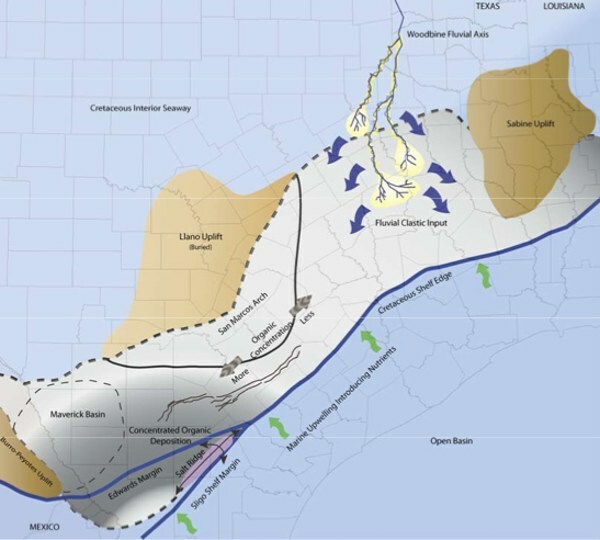 The Pearsall Shale is a gas bearing formation that garnered attention near the Texas-Mexico border in the Maverick Basin before Eagle Ford development truly kicked off. The Pearsall Shale is found below the Eagle Ford at depths of 7,000-12,000 ft, with a thickness of 600-900 ft. Several operators, including Anadarko, Chesapeake, and Newfield, all expect to develop the Pearsall over time (aka when gas prices are better). Exploration in the play will increase as natural gas prices rise to a level that warrants activity. The play does have liquids potential east of the Maverick Basin. As of 2012, only a few wells had been drilled in the play outside of the Maverick Basin. Early results indicate there is potential that has largely been overlooked. TXCO Resources, who later went bankrupt and sold its assets to Anadarko and Newfield, touted the potential of the Pearsall before Petrohawk's Eagle Ford discovery in 2008. The excitement was short lived as TXCO didn't make it through the recession and the Eagle Ford's liquids yields supported better economic returns in a low natural gas price environment. The Eaglebine isn't a single geological formation, but is the name used by operators to describe wells that target both the Woodbine and Eagle Ford formations in a single wellbore. The Woodbine formation is best known as the prolific reservoir in the famous East Texas Oil Field. The Eaglebine is largely targeted at the northern extent of the Eagle Ford region (e.g. Gastar in Leon County, Chesapeake in East Texas). The Eagle Ford Shale producing interval is found at depths between 4,000 and 14,000 feet. The shale is up to 400 feet thick in some areas, but averages 250 ft across the play. Generally, natural fracturing is not prominent. To date, the most prolific area for production occurs along the Edwards Reef Trend (Stuart City Reef Trend) and where it converges with the Sligo Reef Trend. Both geologic distinctions are also referred to as the Edwards Margin and Sligo Shelf Margin.